It took me several sittings to get through this documentary on Swiss surrealist painter H.R. Giger, shot shortly before his death in 2014. As a kid, I was familiar with Giger’s designs for the sci-fi/horror film Alien (1979) and the cover art for prog rock band Emerson, Lake & Palmer’s Brain Salad Surgery (1973). Through the years I saw some more of his disturbing images, in his own collections or on the internet: A crazy mix of biomechanics, skeletons, baby faces, and highly sexualized imagery. This is the stuff mothers are afraid of and heavy metal bands dream of. That said, Dark Star: H.R. Giger’s World is not the definitive portrait of the artist I was hoping for. 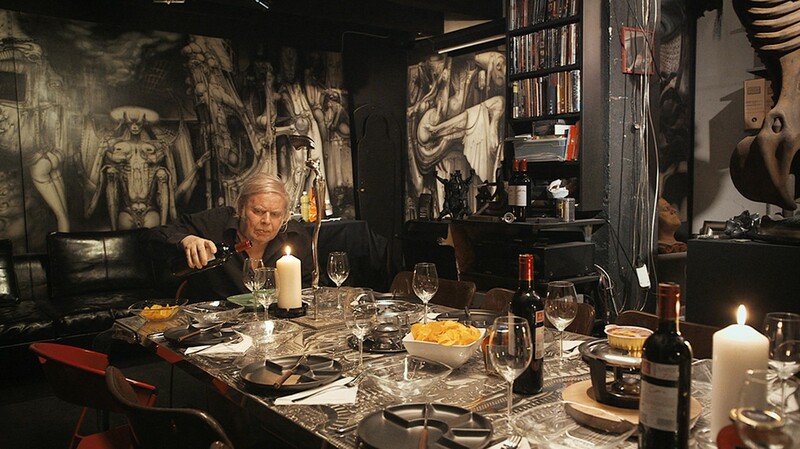 Instead – and surely because Giger was already of ill health at the time of filming – it’s a rather casual look at his home, his family and friends, and his cat Müggi. This in itself does not bother me – I like documentaries that are less formal and more naturalistic, which I think was the intent here. But the fact that Giger himself can barely talk and has trouble walking around makes for a glum 95 minutes that don’t quite explore the merits of his work, let alone the intricacies of the man. The result feels padded by inconsequential interviews, dinners, and endless tracking shots. At one point a psychiatrist is brought in to talk about the trauma of birth and death, in an effort to categorize Giger’s nightmarish landscapes. Maybe we don’t need to know what made him tick – in fact, maybe he himself didn’t know. But I’m sure there can be a more comprehensive look at his life and art than this doc. After all, Giger once said that smoking opium didn’t give him nightmares, but rather helped him get rid of them. And that’s fascinating.